JAKARTA (Reuters) - A former education minister in Muslim-majority Indonesia facing a run-off vote against a Christian to be Jakarta governor, on Tuesday denied pandering to Islamists to win support and said he could unite the capital after a divisive election. 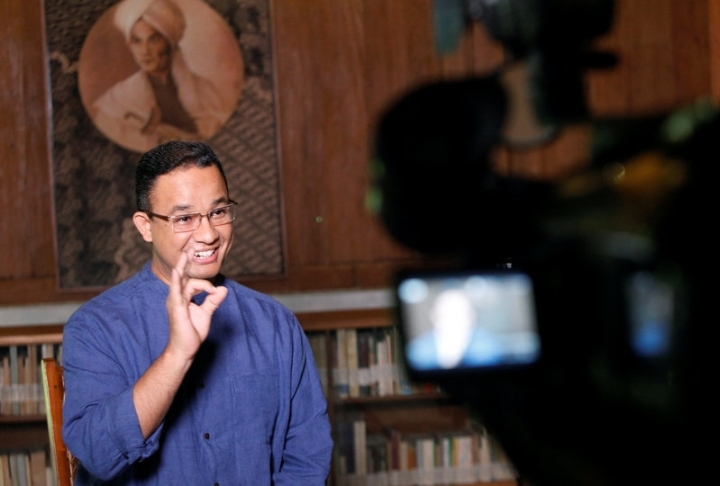 Anies Baswedan is set to take on Basuki Tjahaja Purnama, Jakarta's first Christian and ethnic Chinese governor, in a second-round vote on April 19. Purnama got the most votes in a first round, on Feb. 15, but not by enough to avoid a run-off, unofficial counts show. Campaigning for the poll has been overshadowed by religious tensions, with protests led by hardline group Islamic Defenders Front (FPI) against Purnama, and calls for voters to choose a Muslim. Photographs of Baswedan meeting FPI leader Habib Rizieq were widely published in media, leading his critics to accuse him of tarnishing his reputation as a moderate Muslim. "I think there's a framing that is not fair here," Baswedan said in an interview at his Jakarta home. "If I met the Catholic community, am I then considered no longer a Muslim? If I met the Buddhist community, am I then considered no longer a Muslim?" He said the media was giving a distorted impression of his campaign, which included meetings with a range of religious groups. "Often times, they only see one meeting, even though I've gone for dozens of other meetings," Baswedan said, sitting with a portrait of Sukarno, Indonesia's founding father, hanging on a wall near him. "I interact with all residents of Jakarta." 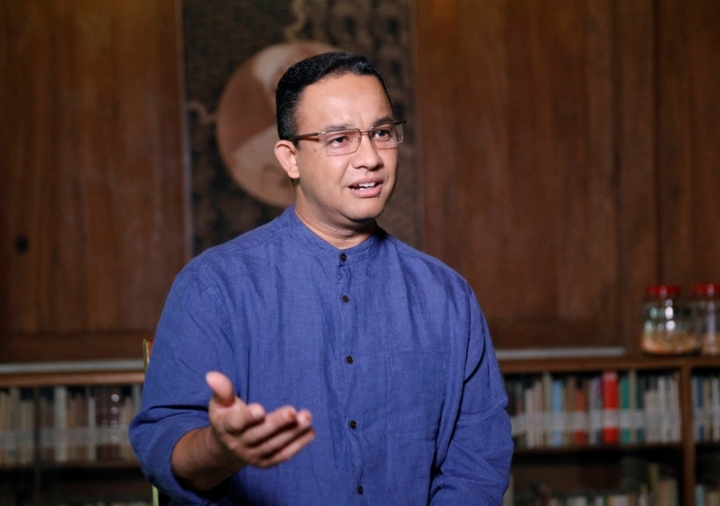 Baswedan, a respected academic who won a Fulbright scholarship to study in the United States, was picked by President Joko Widodo to be education minister, but was dropped from the cabinet in a reshuffle last year. Indonesia has the world's largest Muslim population but is officially secular and home to minority Christian, Hindu, Buddhist and other communities. The post of Jakarta governor has been a stepping stone to higher office. Widodo was previously governor and Purnama was his deputy. The city vote is being widely seen as a proxy battle for the next presidential election, in 2019. Purnama has the support of Widodo's ruling party while Baswedan has the backing of an influential former general, Prabowo Subianto, and his Gerindra Party. Subianto narrowly lost the last presidential election, in 2014, to Widodo. Overshadowing the campaign has been Purnama's trial for blasphemy for allegedly insulting the Koran. He denies the accusation that was filed after he said voters were deceived by his opponents who used a verse in the Koran to imply that Muslims should not vote for a leader of a different religion. The trial, which began in December, seemed to dent his support initially, but it later rebounded, helped by middle-class approval of his efforts to improve the bureaucracy and tackle traffic jams and flooding. Purnama secured about 43 percent of the vote in the first round, ahead of Baswedan with about 40 percent. A third candidate, Agus Yudhoyono, the son of former president Susilo Bambang Yudhoyono, was last with less than 20 percent. Analysts say some Muslim voters may now shift their support from Yudhoyono to Baswedan, who performed well in televised debates. When asked if Jakarta's governor had to be Muslim, Baswedan said every citizen had the right to run, but added: "Jakarta needs an effective leader who can execute all the plans, and secondly, who can unite, not divide." Baswedan said his policies would be centered on increasing access to education, creating jobs and making housing more affordable. One of his main campaign promises is "zero downpayment" for home buyers. "We will continue to focus on topics that are urgent for the residents of Jakarta," Baswedan said.